Oliver Jeffers (left) and Sam Winston (right) are currently artists in residence at Serenbe collaborating on a new children's book. Jeffers is an artist, illustrator and writer from Australia who now lives and works in Brooklyn. He is the illustrator of "The Day the Crayons Quit", the #1 children's book on the New York Times best-seller list. Sam creates sculpture, drawings and books that question our understanding of words both as carriers of messages, and as information itself. A performing poet since she was 14 years old, Sarah Kay is the founder of Project V.O.I.C.E., teaching poetry and self-expression at schools across the United States. She is the best-selling author of “B”, a short hardcover book containing the poem she delivered at her first TED conference. Most recently Sarah spoke and taught at the European Conference of International Schools in Nice, France! Sarah gave the opening keynote address to start off the conference of over 800 educators from around the world. Sarah was a speaker at the 2012 Bonier Grid Conference; a speaker at the TED 2011 Conference, “The Rediscovery of Wonder” in Long Beach, CA; a speaker at the 2011 Cannes Lions Creativity Festival in France; and she was a featured poet on the sixth season of Russell Simmons presents HBO Def Poetry Jam. Check out Sarah's TED talk. And this one as well at TED. New York Times #1 bestselling author of A Girl Named Zippy spent her time researching the works of Carl Jung for her next novel. Kimmel earned her undergraduate degree in English and creative writing from Ball State University in Muncie, Indiana and a graduate degree from North Carolina State University, where she studied with novelist Lee Smith. She lives in Durham, North Carolina. Haven Kimmel was a poet prior to writing the memoir of her early childhood. The Solace of Leaving Early (2002) and Something Rising (Light and Swift) (2004) are the first two novels in Kimmel's "trilogy of place" about fictional Hopwood County, Indiana. The third book, released in September 2007, is titled The Used World. 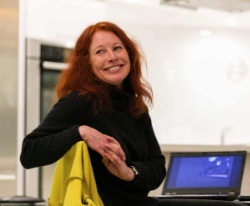 Her other works include a second memoir, She Got Up Off the Couch (2005), a poetic children's book, Orville: A Dog Story (2003), and a retelling of the Book of Revelation in Killing the Buddha: A Heretic's Bible (2004). German artist Cornelia Konrads creates mind-bending site-specific installations in public spaces, sculpture parks and private gardens around the world. Her work is frequently punctuated by the illusion of weightlessness, where stacked objects like logs, fences, and doorways appear to be suspended in mid-air, reinforcing their temporary nature as if the installation is beginning to dissolve before your very eyes. Seeming to defy gravity, the works by the German-based artist use materials found within those landscapes, such as rocks and branches, to form installations which strike an ambivalent pose, caught in the midst of a skyward ascension or a downward accumulation. Suspended in time, the works provide a peaceful, contemplative interaction between nature and man-made culture while forming a bridge of mythic other-worldliness between the two. 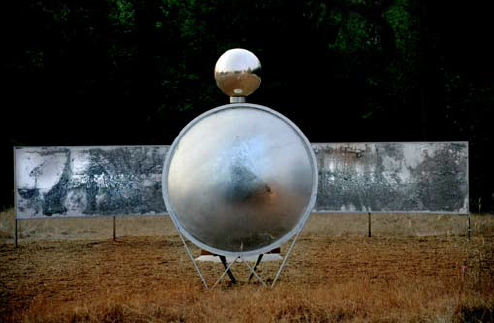 Atlanta artist Evan Levy unveiled a temporary outdoor art installation, “Cellular Cosmogony,” in 2007 at Serenbe. The science and art project combined sound and visual illusion, giving the viewer a sensory experience with enhanced sounds of nature and amplification of their own voice. The work addressed the fragility and mystery of cosmos and the search to understand ones own existence. Evan Levy has exhibited at the Tate Modern, served as president of Art Papers Magazine, was the director of art in Freedom Park, and served as public art coordinator for the City of Atlanta. Amy Park received her B.F.A. from the University of Wisoncon-Madison in 1999 and her M.F.A. from the University of of Wisconsin-Madison in 2003. Amy also studied at the School of the Art Institute of Chicago and Ox-Bow Summer Art School. Her studio practice is focused on large scale watercolor paintings that investigate the history of architecture and abstraction. Park was a recipient of a Marie Walsh Sharpe Space Program Award in 2007-2008. Her work has been exhibited widely in the US at Morgan Lehman Gallery in New York City; The Suburban at Project Row House in Houston, TX; The Poor Farm Experiment in Manawa, WI; and Kopeikin Gallery in Los Angeles, CA. Park is represented by Morgan Lehman GAllery in NYC, where she will have a solo show in spring 2014. She lives and works in Long Island City, NY with her partner, artist Paul Villinski and their son Lark. Artist Update: Park Show Opens at Kopeikin Gallery in Los Angeles. 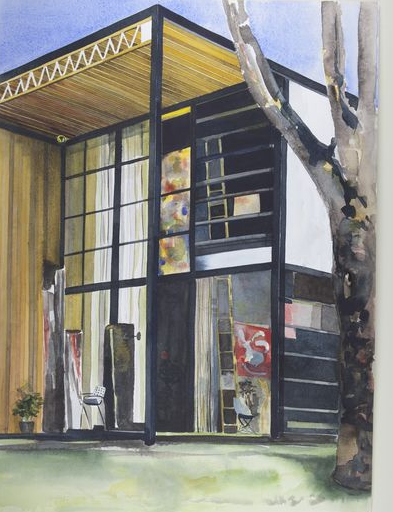 For this show, Amy created large-scale watercolors from the architectural photographs of Julius Shulman's images of California homes and other buildings.